Возрастная категория 1 кл., 2 кл., 3 кл. 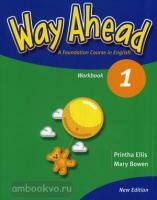 Описание к товару: "Way Ahead 1. Рабочая тетрадь"
Way Ahead is an imaginative, six-level course for primary school children who are learning English as a first foreign language. The course is reading based, with a strong communicative flavour. The structures and functions of English are taught through a variety of inviting, child-centred activities, which have been carefully graded and are suitable for classes in a variety of cultural backgrounds. At the lower levels, the books introduce a cast of interesting characters who contextualise the language and make learning fun. At the upper levels, new language is presented through a series of motivating and informative topics, and the course develops the skills the children need to pursue their studies to a higher level. Вы можете получить более полную информацию о товаре "Way Ahead 1. Workbook", относящуюся к серии: Way Ahead, издательства Macmillan, ISBN: 978-1-40-505856-8, автора/авторов: Bowen Mary, Ellis Printha, если напишите нам в форме обратной связи.